North Pacific swells crashing on Clayoquot's outer coast. How can the worst tailings pond disaster in Canadian history not have legal consequences? 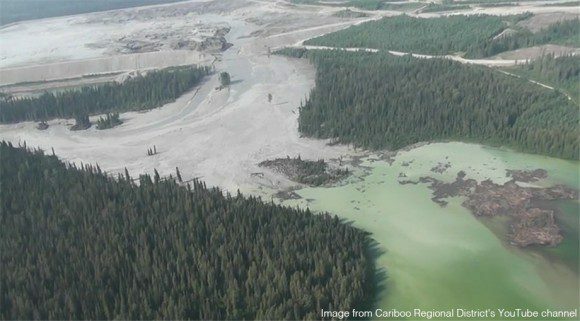 The BC Prosecution Service announced Tuesday that they were taking over and quashing the private prosecution of Mount Polley Mining Corporation over the tailings dam disaster. The charges were laid by Bev Sellars, Grandmother, former Chief of Xat’sull First Nation (Soda Creek), author, and indigenous advocate. Sellars laid private charges against the company on Aug. 4, 2017 – which was the deadline for provincial charges to be laid. This kept the door open for the Province to take over the prosecution, although Sellars was prepared to proceed on her own if necessary. “Apparently that wasn’t enough to prove what we could all see with our eyes,” said Jeh Custerra, campaigner for the Friends of Clayoquot Sound, one of many public groups supporting Sellar’s quest for justice. One of Sellars’ 15 charges was simply that there was a spill, and anyone can watch the video of it online. Sellars and MiningWatch, which assisted in the laying of the private charges last year, say they are now reviewing their options to see if they can challenge Crown’s decision to quash the case. They also said they are hoping the federal government will show more vigour in pursuing its case than did the BC Crown prosecutors. Charges under the Fisheries Act can still be made until Aug. 4, 2019. Fines under applicable BC legislation go up to 1 million dollars per count for some of the charges that were laid. In addition, the Environmental Management Act make allowance for orders to recover funds spent by the Province on remedial or preventive action taken as a result of the commision of the offence. Federal Fisheries Act charges can get as high as 6 million for a first offence, and 12 for second or more. Charges could have been prosecuted under both federal and provincial legislation at the same time, as has been done in other cases, like R v Syncrude, in Alberta in 2010.